The Eco Lodge Selva Bananito, is today an extraordinary example for ecotourism, nestled in a pristine region of Costa Rica’s Caribbean area, the Talamanca Mountains. It is a secluded rain forest lodge situated 20 km south and 15 km inland of Puerto Limón on the Atlantic side of Costa Rica. They generate income from tourism for the protection of 850 hectares (2,000 acres) of privately owned rain forest, and for the funding of special conservation projects there and in neighboring areas. In addition to being available for independent travelers interested in the rain forest, they offer a rain forest study program for high school and college students, a Spanish immersion program, and will soon open the doors to scientific researchers. The family company also leads nature and bird watching tours throughout most of Costa Rica. This private reserve which Selva Bananito LodgeSupports, called Reserva Selva Bananito, is only a 10-minute walk from the lodge and graces the view from the cabins. 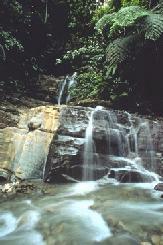 To minimize the impact of tourists on this pristine rain forest environment, they host only a small number of visitors at any one time. 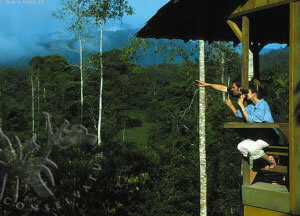 Selva Bananito Eco Lodge and Reserve is located on the family farm. The reserve covers two thirds of the farm and consists of primary rain forest. It shares borders with Area de Conservacion La Amistad (La Amistad Biosphere Reserve), Central America’s largest protected wilderness expanse, which consists of national and international parks and preserves. This area remains one of the least explored territory in the region, its biological wealth only partially known. One third of the land (about 416 hectares or 1,000 acres) is devoted to low-impact, sustainable agriculture and cattle management. Rain forest study programs for schools, colleges, or special interest groups. Spanish immersion courses in the midst of the tropical rain forest. The goal is to provide excellent, personalized attention to customers at reasonable prices.